Tampa, FL – On the week, the national gas price average jumped a penny to land at $2.85. 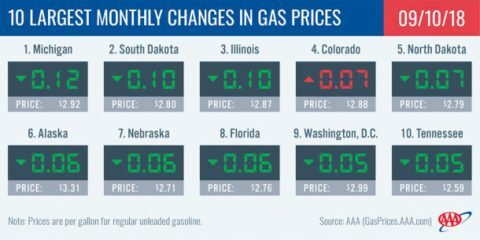 Prices remain relatively stable across the country as gasoline demand dipped slightly and gasoline inventories incrementally built according to the latest Energy Information Administration (EIA) reports. With the switchover to winter-blend gasoline fast approaching (September 15th), gas prices are expected to decline this month. The threat of Hurricane Florence — which is now a Category 2 storm and projected to hit between South Carolina and Virginia by end of this week —will likely have an impact on East Coast gas prices this week should the storm follow its projected path. The nation’s top 10 least expensive markets are: Alabama ($2.52), Mississippi ($2.54), Arkansas ($2.57), Louisiana ($2.58), South Carolina ($2.59), Tennessee ($2.59), Virginia ($2.61), Missouri ($2.61), Texas ($2.62) and Oklahoma ($2.63). The nation’s top 10 largest monthly changes are: Michigan (-12 cents), South Dakota (-10 cents), Illinois (-10 cents), Colorado (+7 cents), North Dakota (-7 cents), Alaska (-7 cents), Nebraska (-6 cents), Florida (-6 cents), District of Colombia (-5 cents) and Tennessee (-5 cents). The West Coast remains the nation’s most expensive region for retail gasoline, with six of the region’s states represented in the nation’s top 10 most expensive list. Hawaii ($3.77) is the nation’s most expensive market, followed by California ($3.63), Washington ($3.39), Alaska ($3.31), Oregon ($3.26), Nevada ($3.20) and Arizona ($2.86). Prices in the region remain relatively flat compared to last week, except for a one-cent jump in California, Washington and Nevada. According to OPIS, a handful of West Coast refineries including Andeavor’s Martinez refinery, Chevron’s Richmond refinery and two Phillip’s 66 refineries near San Francisco and Puget Sound may begin refinery maintenance in the coming weeks. The EIA’s weekly petroleum status report showed West Coast motor gasoline stocks totaled 28.3 million bbl, which is 2 million more than the 26.3 million bbl seen at the same time last year. This 2 million bbl cushion in gasoline stocks may prevent increases at the pump during refinery turnaround season, barring any unforeseen unplanned outages or prolonged maintenance. Motorists in the Great Lakes and Central states are seeing pump prices mostly remaining steady on the week. Only three states saw any ‘significant’ spikes in gas prices: Michigan (+6 cents), Indiana (+4 cents) and Kentucky (+4 cents). South Dakota and Missouri both have the largest pump price drop – three cents – of all states in the region. 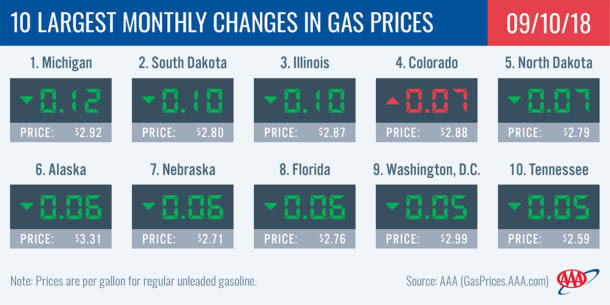 Compared to one month ago, motorists in every state in the region – except Ohio (+1 cent) – are paying less to fill up. Five Great Lakes and Central states land on the top 10 largest monthly changes list: Michigan (-12 cents), South Dakota (-10 cents), Illinois (-10 cents), North Dakota (-7 cents) and Nebraska (-6 cents). Gasoline inventories built slightly on the week to register at 53.1 million bbl, which is the largest inventory level recorded for this time of year since 2008. With demand expected to continue declining, and taking into account high inventory levels, motorists in the region can expect prices to steadily decline this fall. Pump prices have jumped as much as a nickel in the South and Southeast on the week, but only for a few states: South Carolina (+5 cents), Georgia (+3 cents) and Texas (+3 cents). These three states land on the Top 10 with the largest jumps in pump prices on the week. Florida saw prices drop by four cents, the largest of any state in the region, while most states are seeing pump prices a penny cheaper or stable since last Monday. As Hurricane Florence approaches, South Carolina and surrounding states could see brief spikes in pump prices this week. Gasoline inventories continue to register slightly above 80.6 million bbl, according to the EIA’s latest data report. Total inventories are slightly higher compared to most of July and early August, which saw levels below 80 million, indicating that demand may be strong through the region through early fall. This could mean gas prices may not drop as quickly as expected post Labor Day. Delaware saw gas prices make a late-in-the-season 12-cents spike on the week, which was the largest jump in the country and in the region. Part of this increase could be connected to a recent drop in regional refinery utilization that is linked to the unplanned shutdown at Phillip’s Bayway refinery last month. Also seeing increases of more than a penny on the week: Maryland (+4 cents), New Jersey (+3 cents), Pennsylvania (+2 cents) and Maine (+2 cents). As most states see prices decline, four Mid-Atlantic and Northeast state averages still remain at $3/gal or more heading into fall: Pennsylvania ($3.07), Connecticut ($3.04), New York ($3.00) and Washington, D.C. ($3.00). Last week, all eyes were on tropical storm Gordon. This week it is Hurricane Florence, which will most likely impact North Carolina and Virginia pump prices and surrounding states if the storm stays on its projected path. For a second week, gasoline inventories added a surprise build of nearly 2 million bbl, which is helping to keep most state gas price averages steady. Sources say a good bit of the inventory uptick can be attributed to strong imports. Total inventory for the Mid-Atlantic and Northeast sits at 66 million bbl. Motorists in Utah (-3 cents), Idaho (-2 cents) and Wyoming (-1 cent) continue to welcome steady pump price declines after a very expensive summer. Despite the cheaper averages, Idaho ($3.23) and Utah ($3.16) still carry two of the ten most expensive gas price averages in the country. Gasoline inventories had a small, but unexpected small 561,000 bbl build on the week, according to EIA data. At 6.5 million bbl, it is one of the lower readings for the region this year. Gas prices could see larger declines if inventories increase and demand drops in the coming weeks. At the close of Friday’s formal trading session on the NYMEX, WTI dropped two cents to settle at $67.75. The drop in the price of crude oil can be attributed to several factors including increasing U.S. gasoline inventories, wariness regarding U.S. sanctions against Iran, and instability in production in Libya and Venezuela. According to EIA’s report, total motor gasoline inventories increased by 1.8 million bbl last week and are about 7 percent above the five-year average for this time of year. At the same time crude oil stocks dropped 4.3 million barrels from the previous week as refinery utilization rates reached 96.6 percent. 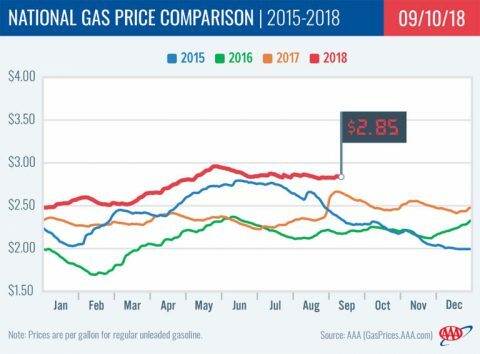 These market dynamics are mostly keeping gas prices flat, but a factor that may negatively impact prices is the threat of Hurricane Florence in the Atlantic. While it is still too early to pinpoint exactly where it will make landfall, the National Hurricane Center reports landfall could occur somewhere between South Carolina and Virginia late this week.